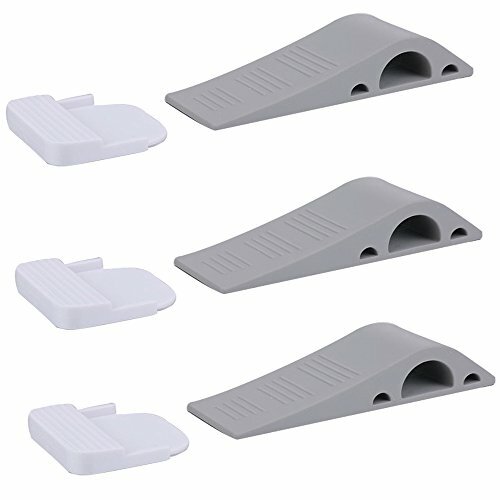 With modern Design Look Unique: Our unique sloped design and anti-slip base provide ultimate gripping power and allow your door stoppers to work on EVERY FLOOR surface. Keep your home neat, tidy and safe! Hangs your door stopper on any door with long lasting 3M super glue technology. Keeps your door stopper secured and organized. Let every corner of your home be under your control ! Premium Quality Rubber: Your new Door Stop is made of REACH certified odorless rubber. They have been rigorously tested and approved by SGS to prove they are safe to use. Modern Design Look Unique: Our unique sloped design and anti-slip base provide ultimate gripping power and allow your door stoppers to work on every floor surface. Further more, they can hold even the heaviest doors. Ideal Size: Your new door stoppers measure L 4.8" x W 1.57" x H 0.98". They will fit under any of your doors hanging anywhere from 0.1 to 1 inch off the floor. Lifetime Warranty: We are committed to provide only the highest quality products and the best customer service. If you feel unsatisfied with your door stoppers for ANY reason, just feel free to contact us, we will defitiny provice you a satisfied solution. If you have any questions about this product by PX Home, contact us by completing and submitting the form below. If you are looking for a specif part number, please include it with your message.